The process described previously provides a number of outcomes which are invaluable in the design process. 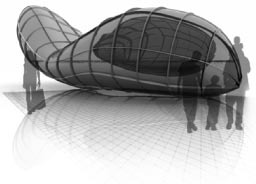 Rhino facilitates the creation of visual images and walk through of the proposed structure. The image shows the rhino model rendered in 3d Studio Max. FEA Analysis allows the structural elements to be sized. Colour coding facilitates the identifying of different thicknesses. Rapid Prototyping produces a scaled model of the structural form. This physical model can be considered in context in a scaled landscape.